When booking a Port Canaveral cruise, many consumers opt to also enjoy a pre- or post-cruise tour in the theme parks of central Florida. Walt Disney World remains a magical highlight. Freelance travel writer Georgina Cruz outlines the pixie-dust sprinkled new attractions, high-tech experiences and dining options that should entice visitors to Disney's FL theme parks this year. So bring on the magic! 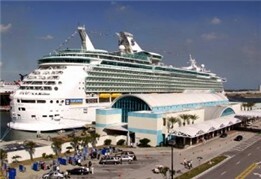 As a gateway to both NASA Kennedy Space Center and the theme park attractions of Orlando, Port Canaveral, FL, just minutes from Cocoa Beach, FL, is a highly popular cruise embarkation point for cruisers. Located along Florida's eastern Atlantic coastline, the port attracts both air travelers who take flights into Orlando or Melbourne, FL, and those who drive from throughout Florida and the southeastern U.S.
Freelance writer and copy editor Lizz Dinnigan provides this brief snapshot of Port Canaveral. She addresses the port's cruising options, services, facilities, parking and plans for what's ahead.